Traffic comes to a website through many avenues, and mobile’s a major highway. As digital marketers and business owners, it’s our job to ensure this road is the shortest, easiest route to our products or services; potential clients, current customers, and the search engines all expect this of us. If you haven’t embraced mobile search engine marketing, don’t worry. You can start now. This comprehensive Guide to Mobile PPC Opportunities covers how to reach your mobile customers through one effective digital marketing avenue: pay per click advertising, or PPC. Herein, you’ll learn everything from how to locate what part of your audience is mobile to tips on how to build mobile-friendly landing pages. Use this guide if you’re new to mobile PPC or if you’re searching for the most valuable ways you can optimize and advertise your mobile site for customers on the go. Let’s start with how to see your mobile audience. You’ve heard the news that mobile searchers have officially trumped desktop searches. It’s safe to assume that some of your customers are using on-the-go devices to reach your business. But do you know exactly how much of your audience is mobile? This is a good place to start your journey into mobile PPC. You can get a clear picture of your mobile paid search audience using either Google AdWords or Bing Ads. We’ll show you how to get this information using both platforms. 2. Choose “Mobile” to see the numbers for this specific device. 3. You can filter the results per campaign or see the numbers for the entire account. Finding the numbers through Bing Ads is slightly different mainly because you have to run a report. 1. Go to “Reports” and run either an “Account,” “Campaign,” “Keyword” or “Ad” report type. 2. Select the columns you wish to add. 3. Add the Device type column to the report. 4. Select “Download” to get the report in Excel. Using either platform, you can see segmented mobile campaign data. You might learn that more people are clicking your PPC ads and visiting your site via mobile devices than you thought. Knowing this information can help you determine a proper budget for mobile marketing efforts as well as help you to create an effective SEM strategy. But knowing your mobile audience is just the first step in creating a powerful SEM strategy. The second step is to monitor the data over the long-term; Google Analytics can help you do that. You will see examples of long date ranges such as “years” and “months.” Select the date range you wish to view. Reduce daily changes by clicking “Week” or “Month” located at the top right of the graph. Select the box for each device you wish to compare. Select “Pot Rows” to see data for all sessions over time. You can compare traffic levels by hovering the mouse over a specific data point. You can also use Google Analytics to compare mobile traffic with non-mobile traffic. From the “Explorer” tab, choose the “Goal Set” to see the data in the table. When it comes to mobile, every aspect of SEM changes and keyword research is no different. Customers who use mobile devices to search online use different phrases than those who use their laptops or desktops. So you can’t just copy and paste your keyword list. Instead, invest some time in proper keyword research for your mobile audience — just like you did for desktop searchers. But since the behaviors and habits of this audience is different than their desktop counterparts, you also have to approach the keyword research process a little differently. User intent: One of the main differences in the behavior of mobile searchers and tethered searchers is the urgency or impetus for the search. Mobile users are usually on the hunt for specific company information such as locations, hours, and phone numbers. Understanding user intent can help you locate the keyword phrases that will get the most traffic to your site. Monitor strong mobile performance keywords. A simple and easy way to select keyword phrases is to pick the ones that are already performing well with mobile searchers. You can find keywords by segmenting the data (keywords, ads, search queries) by device. Then, expand the high performing campaigns and keyword phrases. Don’t start from scratch. Use the Keyword Planner in Google AdWords to learn about the search volume behind your desired keywords and discover similar terms used in the industry. You can easily segment the information via a visual graph that shows mobile trends and a breakdown by device. Mobile-specific ads are designed to influence your target audience while they’re browsing the web on the go. AdWords and Bing Ads offer various types of mobile ads and extensions, making it possible for you to reach your mobile searchers with words, images, and information they’re more likely to respond to. Here’s a look at the most commonly-used ads and extensions you will want to take advantage of. Mobile text ads: These are nearly identical to regular desktop text ads, except they show only on mobile devices. This type of ad, available in both Google AdWords and Bing Ads, is a must for better data segmentation and control over your device-specific messages. Mobile image ads: These AdWords ads are designed to be linked to your mobile website or to an app. Opt in to the Google Display Network to run these ads on mobile devices. Interstitial images ads: These Google ads are featured when a user goes from one screen or page to another in an app. They are full screens with “higher click-through rates than banner ads, but may have a higher CPC.” You can find image sizes appropriate for mobile phones and tablets. Banner image ads: This Google ad is the thin strip that appears at the top of an app page or screen. Your ads will automatically appear as banner ads and interstitials, so you will need to manually change the settings if you want to run only interstitials. Call only: In February of this year Google announced call-only ads in AdWords. Created for devices that can make phone calls, the main purpose of the ad is to initiate a phone call to your business, although you can also include other information, such as your business name, two lines of text, and a display URL. Call extensions: If you want a call-only ad but also want your customers to visit your website, you can use a call extension. Both AdWords and Bing offer call extensions to help you create ads that give mobile users the option to click through to your website or call you using the number in the ad. Now that you know the types of mobile ads and extensions available to you, it’s time to learn how to get your mobile-optimized ads to run on mobile devices. By default, your regular ads will be shown to your mobile audience. However, the key is to make sure AdWords or Bing Ads know to run your mobile-preferred ads — the ones you’ve specifically tailored for this audience. To do this, you simply select the checkbox next to “Mobile” when you create a new ad. You can do this in AdWords and Bing Ads online and in the desktop editors for both platforms. In your campaigns settings, select a campaign. Under settings, select the “Devices” sub tab. Under “Devices,” you will see computers, tablets, and mobile. Select “Mobile,” to adjust the mobile bid. There, use filters and segments to locate particular campaigns. Select “Device,” to adjust the tablet bids. Note: Unlike AdWords, Bind Ads also allows you to adjust bids for smartphones. You’ve created mobile-specific ads and learned how to run them on mobile devices. Now it’s time to see the journey behind the conversion. What do your mobile searchers do after they click on an ad? Do they call your store? Do they buy a product? 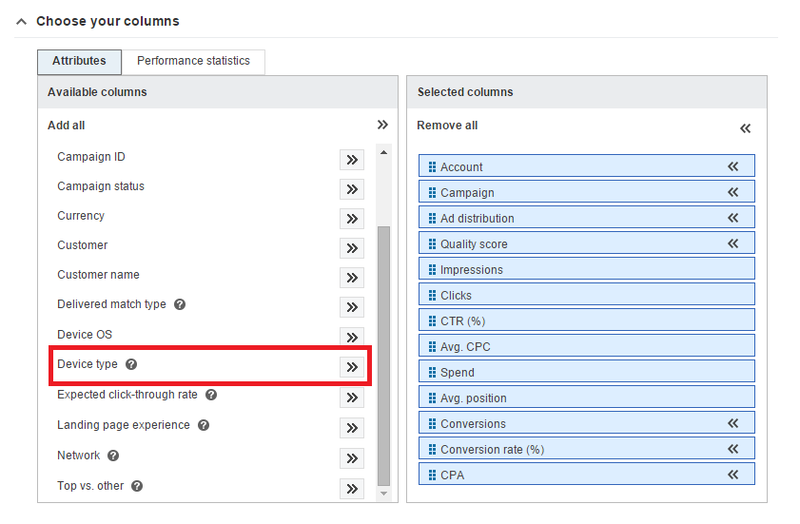 You can find out by using the conversion tracking tool in AdWords. But what if the conversion takes two devices? What if they started a search from one device and then purchase a product from a different device? This is called a cross-device conversion and it’s happening more than ever before. You can now get an idea of cross-device conversions through the Estimated Total Conversions column in AdWords. Monitoring your cross-device conversions will help you understand the role and value that each device plays in getting those conversions. This relatively new column can give you the data you need to tighten and strengthen your campaigns and make better advertising decisions. To access the Estimated Total Conversions column you will need to do two things: 1) Install AdWords conversion tracking on your website, and 2) Have enough conversions in your account. Google doesn’t tell you how many conversions are enough to meet its requirements; however, you will know when the data magically appears. It’s no longer a question of whether a business should invest in mobile PPC; it’s now a matter of how much. The traditional search engine marketing tactics used to reach desktop searchers don’t cut it for the mobile audience. Use the instructions and tips above to learn the value of mobile to your business as well as how to implement mobile-specific SEM strategies that will help reach and satisfy your customers, bring conversions, and grow your business. Great article, today i learn a lot of information about PPC and how to get mobile traffic. These are very important aspects of every business. Keep on sharing thanku. Hi Melanie, Great post, we would also like to know how one can promote mobile application using Google Adwords. In the today’s world of digital marketing, mobile marketing plays a very crucial role. I will definitely use the tips provided in the article to create mobile specific campaigns. Thanks for sharing a very useful and actionable article. Hi Dev, thank you! I’m not 100 percent sure what you mean by “application promotion,” however AdWords has an Ad Extension called “App extensions” that allow you to promote your app in your text ads, including mobile-preferred ads. You can find more information here: https://support.google.com/adwords/answer/2549053?hl=en. I like your post.. it is really very awesome post I very happy to read it.. But I have one confusion that how to optimizing ads for mobile application promotion.